What do you get when you add an array of renowned South Australian wines to puddings and pies? 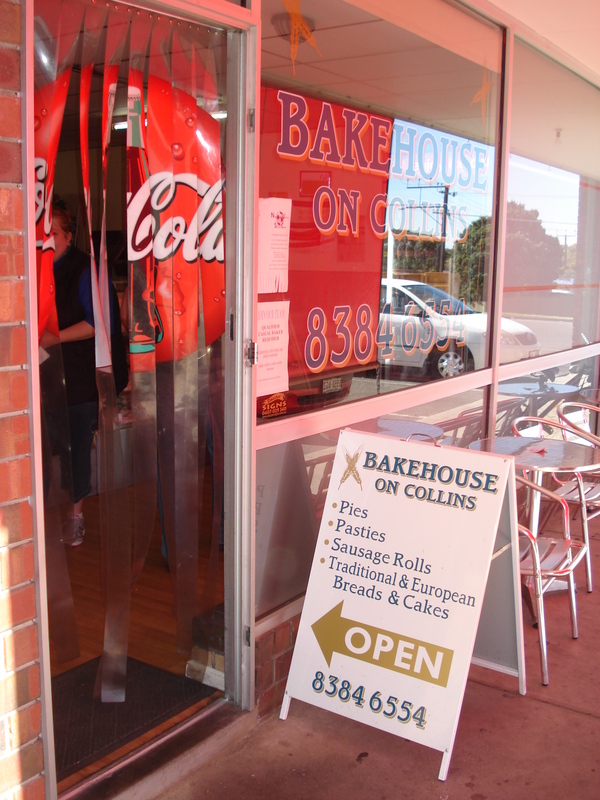 Answer: the best bakery in South Australia. Readers will be pleased to know I have diligently done my research and performed a comprehensive taste test! Peter exudes passion for quality cooking and demanding the best ingredients, all sourced from South Australian producers. His philosophy is to “use good quality ingredients in your product because it makes it taste so much better”. Peter and his wife Agnieszka and pretty little daughter Isabelle welcomed me into their bright shop and my eyes were immediately drawn to the range of fresh cakes, pastries, pies, pasties, sausage rolls, puddings and bread products, all of which were beautifully presented behind a glass screen. All of the products are baked fresh in store. Looking around the back, it was all so clean and tidy and organised, it is hard to believe just how busy this business is. Peter had been working since 10pm the previous evening and it was now 9am and he still had more deliveries to do before he could knock off for the day. 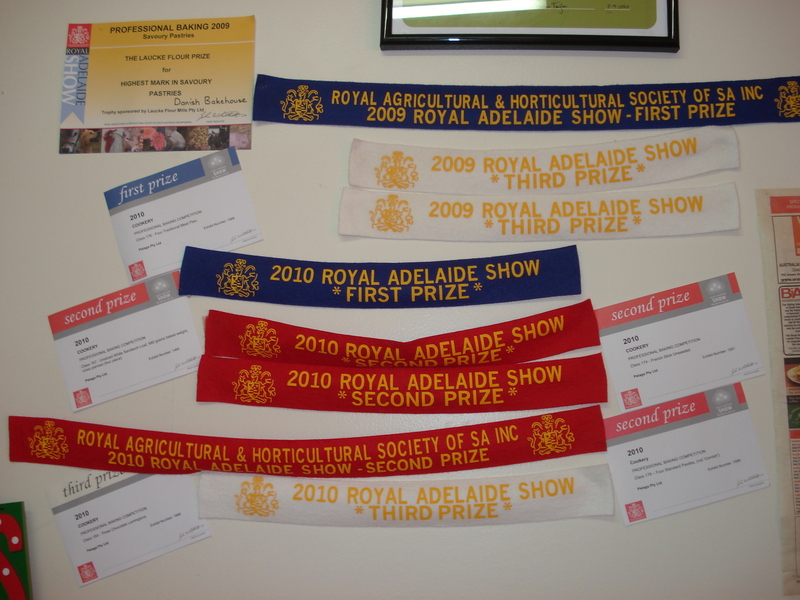 On the wall were a number of ribbons and certificates (pictured) representing a fraction of the 22 awards they have won in the last two years at the Royal Adelaide Show. Having only been operating for two years on 1 December 2010, this is an incredible record. Seven of the awards are top three placings. I was further astounded by the appearance of a huge gold trophy presented for the 2009 Laucke Flour Prize for the Highest Mark in Savoury Pastries. Peter uses shiraz from the K1 winery in the Adelaide Hills in his kangaroo pies and his lamb and rosemary pies, and K1 sauvignon blanc in his chicken and leek, and chicken and Brie pies. 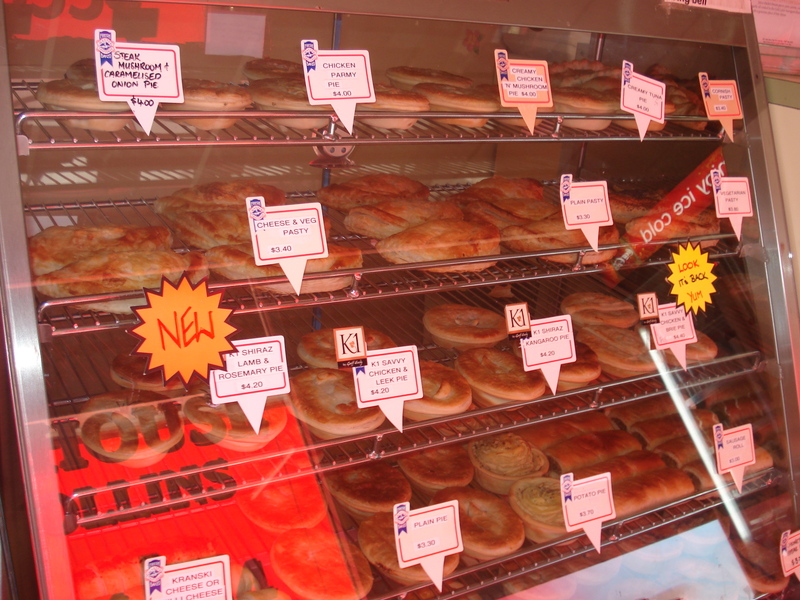 I tasted one each of these pies over the next couple of days and oh boy, I never expected to be blown away by meat pies. I could wax lyrical about every single bite. It was like tucking into a gourmet meal in a top restaurant. I had to look again to remind myself I was eating a pie. The kangaroo pie was an intense flavour explosion of lean red meat, savoury spice and rich wine. In the chicken pie with Brie, the cheese melted down through the pie and smelled divine and perfectly accompanied the flavours and textures of the chicken breast and vegetables, onions, garlic and sauvignon blanc. Wow! They are everything you want in a pie – fresh, lean, tender meat chunks and fresh vegetables in a rich thick sauce, encased in his handmade pastry, not too thick, and baked with a golden crust – and not a single air bubble in sight! He doesn’t just mix the wine in, he marinades the meat in the wine and you can taste the wine, the spices, the vegetables, the top quality meat. For the mince pies and Christmas puddings he soaks the fruit for a length of time (months!) to really concentrate those flavours. 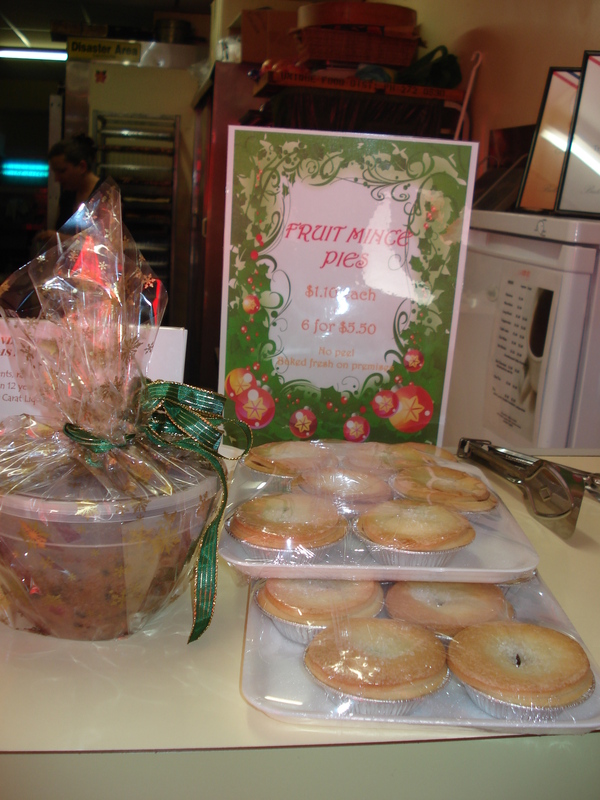 I have sampled a great number of mince pies in my time – Peter’s made me groan with delight. That first smell brought back all my Christmases and I closed my eyes to focus the senses. It was unbelievably good, the rich fruit and sherry are an élite taste sensation, and the golden pastry just sweet enough, was all in perfect balance. This man is a genius! It all becomes clear why he is so adamant in using fresh, top quality ingredients in everything he makes. Plus his prices are extremely competitive – at just $4.20 to $4.40 for the pies, six mince pies for $5.50, and $20 for the 800g Christmas puddings – once you have tried these you will be a regular. No one else’s come close. I shall certainly be a regular customer and recommend this exceptional baker. This business deserves to continue to be a raging success. This entry was posted in McLaren Vale wine, New World wine, Sauvignon blanc, South Australian wine, Syrah/Shiraz and tagged Adelaide Hills, Australian wine, K1, Laucke, McLaren Vale, Pirramimma, Sauvignon blanc, shiraz, South Australian wine, Tinlins, Wine, wine. Bookmark the permalink. Hi Nicola, I did promise you that when I get back to Sydney I will read your blogs. To refresh your memory my middle name is Nicola. I was in S.A a few weeks ago travelling around with my wife and two and a half year old son Samuel. 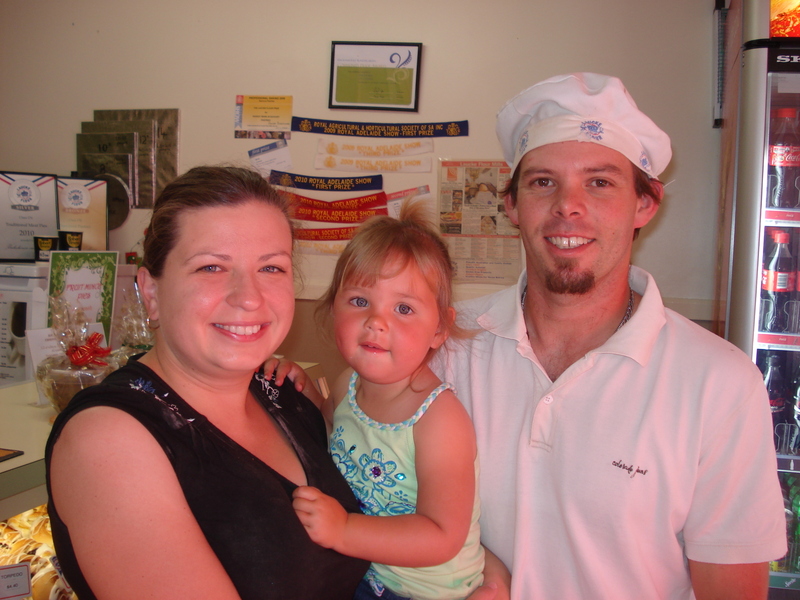 We visited you at Pirramimma and my wife and I were tag teaming the tastings as my son was asleep in the car. He woke in time and my wife brought him in and met you also. We so loved the wines there. We were on our way to K.I and because we all got chatting and my stay there was alot longer than expected, we only just made it to the ferry in time. Breaking many land speed records to do so. I did underestimate the distance to the ferry as well which didn’t help. All fun and we arrived safe and sound. Our trip around S.A was excellent. Am reading through your many blogs and thoroughly enjoying it, especially this one. If only I knew about it when I was there…love a good pie! Take care and keep up the great work. I certainly remember all of you – glad you made the ferry! Thank you for your kind words about my blog. I do enjoy doing it and it is great to get some positive feedback. Keep reading! I have lots more ideas.